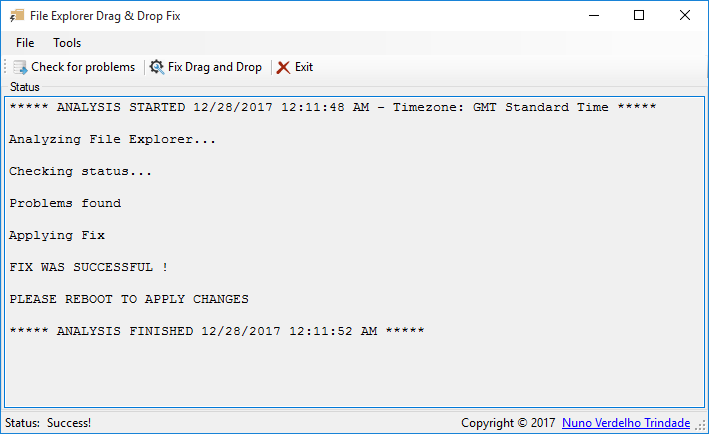 A utility for fixing common drag and drop issues in File Explorer. 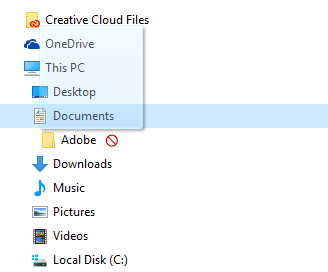 This is a known problem, especially in Windows 10 Operating Systems, where suddenly drag and drop no longer works inside Windows Explorer/File Explorer (similar to the image bellow where you get a “stop” icon instead of a “plus” icon and are unable to drag and drop in file explorer). The App will search for integrity problems associated with the drag & drop functionality and also context menu related problems and try to repair them. To scan for problems, click the “Check for problems” button. If drag and drop problems are found you can then fix it by clicking the “Fix Drag and Drop” button. IMPORTANT: You must reboot you system before changes take effect. This software is experimental and may damage your system. Use it at your own risk.. It was developed for Windows 10 systems with no drag and drop in Windows Explorer, but it may work with older versions of Windows. The program is free for personal use. If you intend to use this software for professional/enterprise purposes, please request a professional license. Bellow you can find the 32 and 64 bit versions of File Explorer Drag & Drop Fix. Please make sure you use the appropriate version for your system, otherwise the drag & drop problem in Windows Explorer will persist and you may damage your system.